Texas A&M and Michigan look to make magic happen on the hardwood in L.A. These two football traditional schools make the long trip to Los Angeles to battle each other in the regional semifinal round of the NCAA Tournament. No. 7-seeded Texas A&M (22-12) collides with third-seeded Michigan (30-7) as both vie to move on to the regional final. Not to say history matters, but this will be Michigan’s 14th time in the Sweet 16, winning 12 of the last 14 contests. On the other hand, Texas A&M looks to break through in its seventh attempt to get to the Elite Eight. Both teams have shown to be unlikely to be here for different reasons. A&M because they have proved to be inconsistent on the road with a record of 4-7. Michigan on the other hand got this game with an unbelievable shot from Jordan Poole to advance from the second round over Houston. The Wolverines have been moving along consistently well throughout the year. Coach Jon Beilein has gotten his team to hum at the right time of year. The Wolverines ride an 11-game winning streak, highlighted by victories over Ohio State, Purdue and Houston; all making it to the big dance. 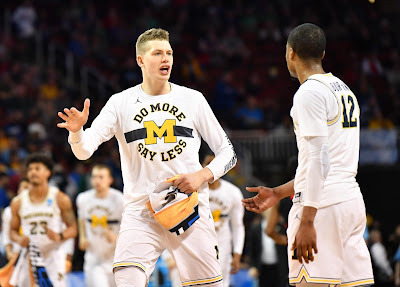 Junior forward Moritz Wagner has carried the Wolverines this year with a team-high 14.2 points and 7.1 rebounds per game. Wagner has yet to find a groove in the tournament with an average of 8.5 points. On the other hand, Aggies leading scorer Tyler Davis has done more than his season average with 14 and 18 points of game production in the first two rounds. The Aggies come into the game riding high after beating No. 2 seed North Carolina in the second round, 86-65. T.J .Starks being the go to guy giving the Aggies their 13th NCAA Tournament win in school history. Although both teams have a clear highlighted player— each team will need assistance from their supporting cast to oust the other. This may come from two likely people. Charles Matthews and Admon Gilder are the sous-chefs for Michigan and A&M respectively. Both taking the games to another level in prior tournament rounds. Matthews pushed his game points to 20 and 11 for the first two rounds. Gilder having in an eerily similar game of 18 and 12 points, respectively. Texas A&M has done a great job with a liberal scoring attack as five players have finished in double figures with one player coming just shy of that amount. Their well balance attack will be interesting up against of Michigan defense who only allowed 62.8 points per game which is eighth best in the country. Also, creating turnovers and problems for the oppositions back court with tough on the ball defense. Whomever wins will be in Los Angeles for another two days as that team will take on the winner of fourth-seeded Gonzaga (32-4) and ninth-seeded Florida State (22-11). Gonzaga looks to continue on last year’s road to the Elite Eight— having been there in 2015 and 2017. If Florida State wins, it will be its first time in the regional final in 25 years when FSU beat a surprising Western Kentucky team in overtime with a 81-78 win to move on.